Tourist Information Centre Walk 47 at Winterton via East Somerton01493 846346work Walking RouteThe Winterton-on-Sea via East Somerton Walk is a 3.3 mile (5.3 kilometre) circular walk starting at the Beach Road public car park in Winterton-on-Sea near Great Yarmouth. A walk with great coastal views which will take you along a route passing the remains of St. Mary's Church hidden in the wood, the current 14th century church of Holy Trinity and the site of WInterton-Horsey Dunes which is a site of special scientific interest. Next to the car park and starting point you will find public facilities and the WInterton Dunes Cafe which is always a good spot for refreshments. 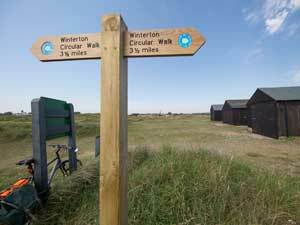 The Winterton-on-Sea via East Somerton Walk is a 3.3 mile (5.3 kilometre) circular walk starting at the Beach Road public car park in Winterton-on-Sea near Great Yarmouth.